Why should superheroes have all the fun? In SVK, a new one-shot comic by Warren Ellis (Transmetropolitan) and Matt Brooker (2000 AD), you get a power of your own: mind-reading. Shine the special torch (bundled with the book) on the page and you reveal the characters’ thoughts, printed in UV ink. I gotta tell you, it’s magical. 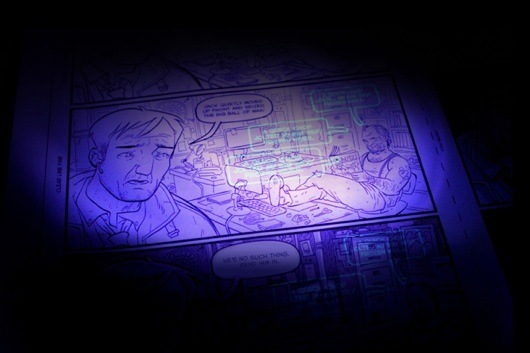 Read more at Wired: How Warren Ellis is using torchlight for his latest comic. We’re due to publish Ellis and Brooker’s creation in April 2011. Sign up for news of SVK’s release at getsvk.com.